This is a zoom lens manufactured by Tamron and the model was launched 2004. This lens is constructed to fit all models of Canon and Nikon cameras, regardless of camera model or type of sensor. The lens has a focal length of 200-500 mm. Depending on which camera the lens is used, the experienced and perceived focal length will be different. Please visit the list of compatible cameras below, it will provide the equivalent focal length you get on each camera. The lens brightness and aperture value is f/5-6,3. One thing to consider is that the lens has a variable brightness, which means that depending on how much you are zooming the lens will have a different maximum aperture value. At 200 mm the lens brightness is f/5 and at 500 mm the brightness is f/6,3. Through the link below you can read more about what this could mean for you as a photographer. The lens has a traditional filter thread on the front and its measuring 86 mm which also the filter you will use must have. If you use for example an UV filter can be a cheap insurance against scratches and dust. Text from Tamron: "The Tamron SP designation is reserved for lenses developed with special emphasis on extraordinary photographic performance. Engineers are free to innovate in an uncommon atmosphere where optical performance comes before price, resulting in lenses that satisfy the demands of discerning photographers. Extreme photographic conditions call for extreme, specialized optics. Distant and elusive wildlife, birding, team sports, motorsports and surveillance are just a few of the photographic conditions that demand both zoom versatility and extreme telephoto power. APS-C-sensor photographers will enjoy super-telephoto magnification, with a picture angle range approximating a 310-775mm lens on a 35mm film or full-frame DSLR. Featuring LD (Low Dispersion Glass) to combat chromatic aberrations and an Internal Focus mechanism that maintains a fixed barrel length when focusing, the SP 200-500mm provides high telephoto magnification accompanied by the sought-after perspective compression effect that draws even greater attention to subjects. 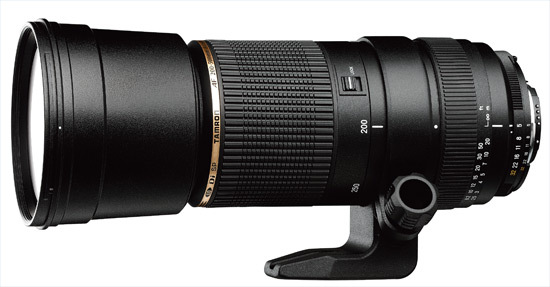 While not a small lens, when compared to other similar focal lengths, the SP 200-500mm is an easy choice for outdoor enthusiasts who often must hike great distances with their gear, in search of their subjects. This super performance ( SP) tele-zoom has everything to satisfy the desires of successful nature or sport photographers. The extreme tele-end lets you bring your far away subjects up close and allows you to capture the images in a frame-filling format. The power to bring your subject nearer makes out interesting image compositions, and extends the photographic and creative horizon substantially. Furthermore, the lens offers fantastic image quality thanks to the application of modern design principles and high-quality glass. The lens is equipped with a tripod adaptor and a filter Effect Control ( FEC), to simplify the use of polarization filters. Chromatic aberration, which is a problem with many telephoto lenses, was minimized by the application of a LD (Low dispersion) element with low color dispersion. Clear colors, high resolution and brilliance are visible at every focal length as a result of this optimization. * SP (super performance) high-capacity lenses of excellent optical and mechanical quality. Please note: The Nikon mount is only compatible in the MF mode with the following Nikon cameras: D40, D40X and D60. This is due to fact that these 3 cameras require lenses with a built-in motor. The Nikon version of this lens does not have a built-in motor."